Northwood's Peacock and Urn can be distinguished from Millersburg's by its smooth, or plain, base. Millersburg's has a many-rayed star. Two moulds (one large and one small) appear to have been used through all of Northwoods Peacocks & Urn production. 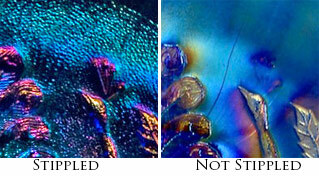 They were, however, modified multiple times – so there are 4 small and 3 large variations. 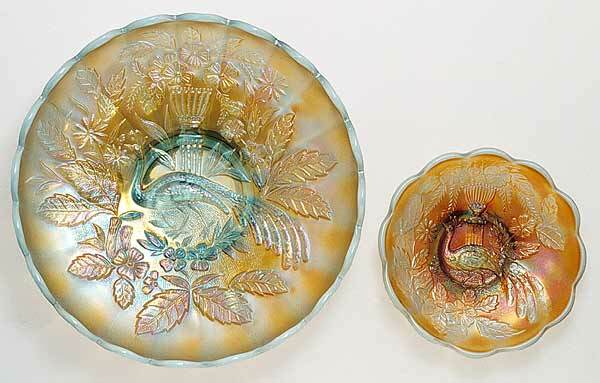 Interestingly, ruffled versions of these bowls are much more rare than the ice cream shapes. Above are extremely rare bowls in aqua opal. Below is the table that Ron Britt has assembled in order to help differentiate between the variations. Does your peacock have 2 tiara? Are they facing forward, back or both? Is the entire face stippled? Check it out here!